If you’ve got several cookie jars stuffed full of $100 bills, then executing a full-scale kitchen remodel all at once makes sense. But what about those homeowners whose cookie jars are filled with, well, mostly cookies? You can still get that beautiful kitchen of your dreams, you just need patience and a well-thought-out game plan that breaks up your remodel into several stages spread out over time. That way you can save up (fill that cookie jar!) and spend only what you can when you can. Maybe this month it’s painting the cabinets. Maybe later in the year you buy new appliances. There are plenty of benefits of a phased project, but there are also several pitfalls you want to avoid. This five-part series will help you navigate those stages to a successful remodeled kitchen. A phased remodel gives you the ability to spread out payments over time, which is good for people who can’t pay for a full remodel up front and aren’t comfortable taking out a large loan to cover it. Breaking up a project also allows you to change your plan between stages, something much more difficult when you’re in the middle of a full-scale remodel. If you decide to reverse course in some aspect of the plan, it will likely cost less than changing course would have been if the whole remodel were done at once. But a phased project requires immense patience and strategy. Your first impulse may be to dive right in, but I’m here to tell you: don’t. When planning a kitchen remodel over stages, it is important to rein in those early rash decisions. Do not buy new appliances, fixtures or countertops. Do not paint, do not replace windows, do not knock down that wall and do not replace your cabinet hardware. If you act on impulse and rip out that awful tile countertop and replace it with a gorgeous slab, you have seriously limited yourself going forward. What if you end up wanting to change out the undercounter sink or, worse, modify your entire kitchen layout? That stunning new countertop may have to go, and you will find you have wasted time and resources. Buy new appliances now and the finish and style might not work with the new cabinets you planned on adding next year. So just be patient and focus on developing a comprehensive plan. Your project may be simple. You may want new appliances and fixtures, painted cabinets and new countertops. Or it could be more complex. Maybe you need to expand the kitchen, take down walls, build into your backyard and add living space. This is the time to visualize and study your expectations carefully. The success of your project begins with asking yourself: What do I want my new kitchen to look like, and what work is required to get there? If you can’t come up with an answer and feel overwhelmed already, you simply need help. A designer is a good place to start, although an experienced architect or builder could also be the right starting point. After reading this series, you will have a better idea of what your remodel will entail. That’s important, because it might turn out that you can successfully manage your remodel on your own. If you are simply painting walls and cabinets, updating appliances and possibly replacing a plumbing fixture or two, you might not need much outside help. On the other hand, if there is more major work involved, with modifications to the floor plan (especially changes that include new rooflines, exterior additions and structural modifications) an architect can be invaluable. Architects are experienced at getting your plan approved through local building departments and also advising how to create new living space that functions properly and looks great. It can be challenging to get a good general contractor on board when executing a remodel in stages. The ones with sterling reputations are generally busy, and it’s not ideal from their perspective to allow time to lapse between steps. They want to get in and get out, then move on to the next job. Plus, who’s to say you won’t change your mind in six months or not have the financial means to execute the next stage of your remodel? So you are left with two options. Manage your own job, or find a contractor willing to take it one step at a time with significant breaks in between. If your job is extensive, you really need to do some soul searching before deciding to be the general contractor on your own job. There are many who can handle the task, but if you have no experience, there is great potential that it will end up costing you. There are contractors willing to break a job up in stages, but you’ve got to have a high level of trust due to risk factors, including the contractor being unable to finish the job months later, or overbilling in the early stages. Traditional by Budget Remodeling Inc.
Once you have settled on your total objective, it is time to define the scope of your project. If working with a pro, he or she can take your hand and walk you through your project conceptually. If you are managing the job, defining the total scope falls in your lap. Generally, the tasks of the job are broken up into subcontractor categories — framers, plumbers, cabinetmakers, electricians, drywallers — and selections, such as tile, countertop slabs, light fixtures, paint colors and so on. We will be going into these breakdowns in a little more detail in subsequent parts of this series, but the gist is this: Use a spreadsheet to specifically define the scope of work or each subcontractor category, and also specify each required selection. For example, you may need to make plumbing selections for a new sink and new faucet. Those are selections. The related subcontractor work, or work scope category, would be the plumber required to install those fixtures, possibly relocating the supply and drain. If there is a physical plan including floor plan and elevations, study carefully and try to imagine the process (later in this series we provide tips to help), making sure nothing is being left out. Kitchen by Budget Remodeling Inc.
Allowances are the enemy of accurate cost estimates. When builders bid a job without firm selections, they have no choice but to make assumptions as to your likely selections, and these assumptions are called allowances. If you are estimating the cost of your own job, you have the same problem. You can estimate all your appliances will cost $10,000, but what does it really mean if you haven’t been to the appliance store? There are some refrigerators that cost $10,000 by themselves, and the same idea holds true with nearly every selection you will be making. If you want to have an estimate that means anything, you need to actually select your appliances, plumbing fixtures, light fixtures, slab countertops and any other selection you can imagine. Get firm quotes for the materials so you can factor those costs in accurately to your total estimate. Making these decisions collectively is always a good idea in a remodel, but when executing work over phased stages, it becomes even more critical. It takes extra planning to ensure each step complements the pending ones. Imagine the countertop replacement we discussed earlier. Your tile countertop is simply the bane of your existence. The grout is stained and cracking, and the tile itself looked dated in the 1980s. If you run out and replace the tile with a gorgeous slab countertop, you might enjoy the smooth surface for a while, but you have thereby limited yourself if there is a Step 2 and 3. The slab color may not work with your preferred cabinet color. You might not be able to find a backsplash complementing the unique characteristics of the granite slab. Worse, you no longer can replace your cabinets and have severely limited any layout modifications you might have wanted to consider. So, make all your selections in the beginning so you know everything will work together in the end. A good estimate on the total cost, properly divided into each stage, is imperative for this plan to work. If your plan is simple and includes new appliances, new paint and some new hardware, then the estimate will be easy. Go to an appliance store or go online and price out the appliances. Get that painting bid for your cabinets and walls. Count up the hardware requirements, price out your selection, and there you have it. Three simple stages and not much risk (as long as you confirm your appliance selections fit their respective spaces — more on that later). In larger, more complex jobs, though, it’s difficult to properly price things out without some experience, as kitchen remodels can potentially involve framers, finish carpenters, drywallers, electricians, plumbers, tile setters, slab fabricators, painters and possibly even foundation contractors, roofers, insulators and more. The point is that it can be challenging to properly estimate a phased remodel, or any remodel, but you need to have a go at it and keep refining and updating as needed. Contractors are experienced at the task, but if you are estimating on your own, make sure you get bids for every subcontractor task and price out the fixtures and materials. And, if you can, try to get some consultation from someone with experience. Physical, financial and mental preparation are all required before you begin the journey. If you have lived through a kitchen remodel like me, you may have washed dishes in the backyard with a hose and bucket for weeks on end, stocking the packed cooler outside with ice twice daily, eating out some, but basically surviving on bare necessities while trying to keep your kids from starving, your marriage alive and your sanity intact. By cutting the job into stages, you can give yourself breaks to catch your breath. But it also extends the discomfort to some degree — like removing a Band-Aid slowly rather than in one swift motion. You do not need financial stresses to add to your difficulties, so make sure you have done all the preparation you can. How will you feed yourselves? Will the money be there when you need it? How long are you mentally prepared to live this way, and how will you manage if it takes longer than you hoped? If you have designed your plan, made your selections, decided whether to seek a professional’s help, built your budget and constructed a temporary plan for survival, then you can proceed with some semblance of confidence. OK, the truth is, you are still only almost ready. With Step 1 complete and your plan outlined, now is the time to begin breaking up your scope of work into stages. Next week we will show you how. Over the years, many have noticed the humble kitchen evolving from a small cooking place into a dynamic living area. Those involved in kitchen remodels have seen many new innovations in both visual and functionality. We’ve seen a continuation of the growth in ultra contemporary shaker style cabinetry with bright white dominating the color themes. Further, statistics show the upper end kitchens still prefer the traditional raised panel cabinets in an off-white/eggshell color and the darker, rich cherry stain cabinets coming in second. Choices in back splash and wall coverings have virtually exploded with an incredible variety of designs and materials. Consumer choices of knobs and pulls have also become a great way to give your kitchen its individual character. *Under-the-counter microwave placement is a wonderful example of how a simple base cabinet conversion can be a safer, more convenient use of space. Studies have shown that the traditional over the range microwave can actually be dangerous for children or shorter people when they are removing sizzling hot dishes from “above the shoulder” level. With the trend to remove counter clutter, under the counter is a natural. *Fold Down Hardware attached to the bottom of the upper cabinets is designed to hold tablets/recipe books/TVs. Again, the trend to remove counter top clutter and increase work space brings some really cool and inexpensive ways to bring information to a cook’s finger tips or introduce entertainment or a just another focal point! *Electrical Outlets are also being placed underneath (and sometimes inside) the upper cabinets rather than the traditional placement along the back wall. *Built in pet feeding cabinets. 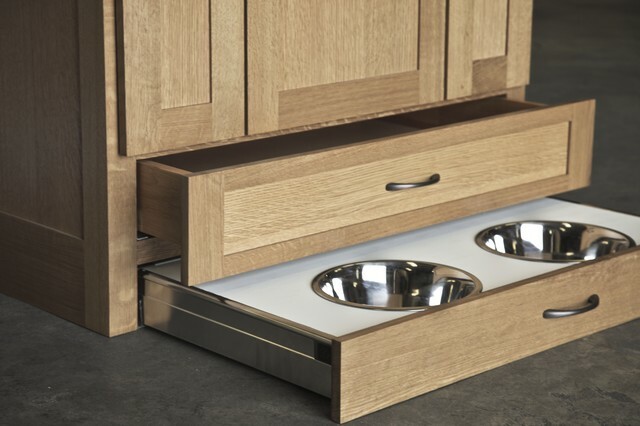 Consider asking your carpenter to build a food bowl drawer that rolls out from below a base cabinet. The “toe board” is typically covers wasted space that is easily converted into extra storage. *Island seating has become much more prevalent in the remodel markets as the baby-boomers, gen-x and millennials all tend to want to entertain in the kitchen. Incorporating some of these modern ideas into your kitchen renovation may depend on many factors. First, your considerations should include your wants and needs, not necessarily what the best resale ROI might be. Think about the make up of your household, now and in the future. A young family may want to consider space for a study desk or computer work station where a retired couple may want to consider wheel chair space and easier access storage. What ever your situation might be, researching new trends and innovations in kitchen designs and kitchen cabinets can certainly help make your remodel project a lasting success.